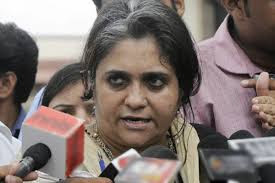 Top human rights activist, fighting the 2002 Gujarat riot victims' cases, Teesta Setavlad, has said the organizations she and her husband Javed Anand represent – Citizens for Justice and Peace (CJP) or Sabrang Trust – never applied or appealed for, or received grants or donations “intended for the financial assistance of any kind” for the welfare of the “victims-survivors of the 2002 communal carnage in Gujarat” between 2007 and 2014. The only thing the CJP applied or appealed for grants and donations was “to provide free legal aid to the survivors and eye-witnesses in their search for justice and punishment to the perpetrators of the mass crimes in 2002”, the statement says. Setalvad's statement follows the reported claim of the Gujarat police before the Supreme Court that documentary evidence on Setalvad and her husband "siphoning off" Rs 3.85 crore for "personal use" from the Rs 9.75 crore donations received by the two NGOs for the “welfare” of the 2002 riot victims. Running into 83-page affidavit, assistant commissioner of police, Gujarat, Rahul B Patel, accuses the Setalvad and Anand, as also other trusees of the two NGOs, of “non-cooperation” in providing documents needed to “investigate complaints” by riots victims of Gulbarg Society, which was one of the worst sites of massacre in 2002. Gujarat police said, this became evident on “examining” the bank accounts of CJP and Sabrang Trust, adding, the couple also drew money for “personal use” from the Rs 1.40 crore grant given by the Union human resources development (HRD) ministry from February 2011 to July 2012.